We love to hear from you. I’m sure that’s what you’re thinking, anyway, as you prepare volumes of paper to send to our mailbox. But just so you know, let me explain just how much we love the material you send us. 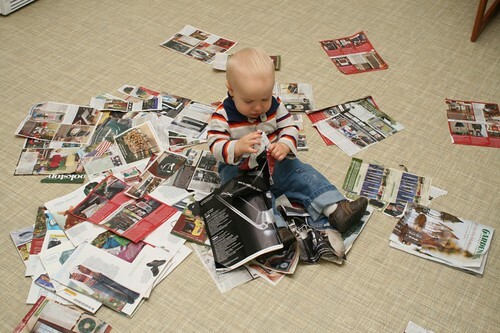 When we get one of your catalogs, it will get added to the junk mail pile. Every so often, I will go through this pile. I will contact the company behind each and every mailing, asking them to remove me from their list and not rent my name further. If I have extra time, I will probably also write that note on your postage-paid envelope and pop it in the mailbox. I will also add your name to my list of companies that send me junk mail, so I can avoid doing business with you in the future. If you have sent me junk mail in the past, rest assured that I will find some creatively enjoyable way of dealing with your refusal to honor my removal request. After I have processed your piece of artfully-crafted handiwork, possibly trying to sell me pink laptops or a shirt with the word “femail” on it — whatever that means — I will deposit your catalog, along with dozens of other similar catalogs, on the kitchen floor. This is when the real fun begins, because now it’s Jacob’s turn to process them. 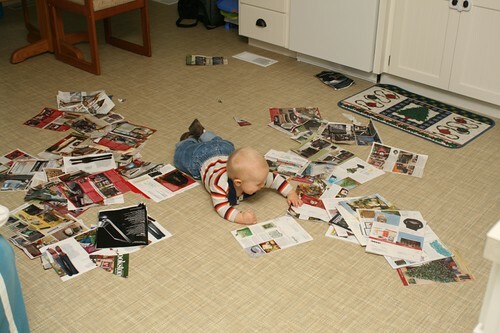 He will usually start by ripping out every page from the catalog. He’ll start slowly and carefully, ripping out pages one at a time, savoring the wonderful rrrrriiiiippppp noise as he goes. But then he’ll get faster, going for two pages at a time, then more, until finally he just will lunge for paper by the handful to crush, tear, or otherwise mutilate. After that, there are many things he might do to your fine piece of unsolicited advertising. Perhaps he will enjoy drooling on it — a satisfying fate for your 4-color catalog, don’t you think? Or perhaps he will grab some of your pages, carefully emblazoned with your logo, and tear them into as many tiny bits as he can. Or maybe he will simply gather your work together on the floor, then spin himself around on top of it, scattering the remnants as far and wide as possible, cackling all the while. He may also smear bits of food on them if he ate recently, or perhaps he will simply resume tearing pages apart. But whatever he does, rest assured that he will treat your catalog with the care and attention it deserves. No catalog will survive intact, and as many pages as possible will be ripped apart and left in bits. He does, after all, have a great attention to detail. After Jacob is done, we will gather up what remains and put it all in our recycling container. Oh, and under no circumstances will we actually make a purchase from your catalog. Here are two pictures of the scene. Notice the careful concentration in this photo. Obviously he knows that Dell has been ignoring my removal requests for some time, and is taking note to tear their pages into the smallest possible bits. But it’s not all hard work — processing your catalogs is fun, too. Write them and tell them you want to be removed from their mailing lists. They now charge $1 per name to do that. I’m not sure if I want to be contributing money, however small, to the trade group for the very people that send us this stuff, so I haven’t done it yet. The problem is they don’t make good fire starters and they tend to build up in a burn barrel. Loved the pics of the trip back home. Jacob is a cute little guy. Might I suggest a slight remix to your system? Save the pre-paid envelopes for the very end, and divert some of the shredded catalogue from the recycling bin to the envelope. At least that’s what I do for credit card applications.